The controversy surrounding a Long Island community's attempt to construct an eruv and opposition from some local residents reached a boiling point of sorts this week when it became the subject of a report on The Daily Show, Jon Stewart's popular news program that's laced with heavy doses of parody and satire. 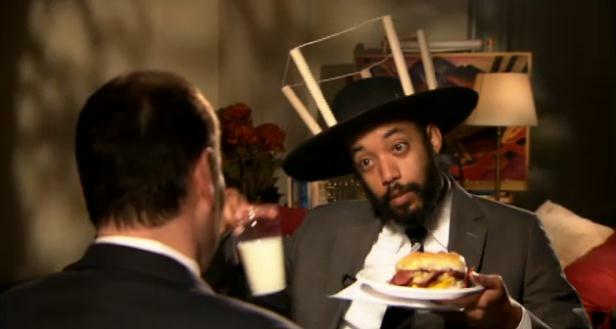 The bit, called The Thin Jew Line, airs as a “news” report by “correspondent” Wyatt Cenac. The satirist interviews Jeff Weisenfeld, member of the Hampton Orthodox Synagogue; Charles Gottesman, member of the Jewish People Opposed to the Eruv; and residents at the Beach Bakery in Westhampton Beach. The five-minute spoof already has people in Westhampton Beach talking. Arnold Sheiffer, who heads up the Jewish People Opposed to the Eruv, said he was approached by the Daily Show to appear but he refused. He says the spoof "missed the point of the situation entirely." He said, "There is nothing funny about this. The vast majority of Jewish people oppose the eruv becuase it does not keep with the basic tenants of the Jewish tradition of honoring customs and tradition in the area of which you live." Sheiffer also said that the show did not point out that "the eruv benefits very few and extends to their economic benefit." Sheiffer said he was further disappointed to see that the show made a "mockery" of Gottesman. "It's a shame. He is a very nice person and a credit to the community," he said. Here's the report as it appeared on Wednesday's edition of The Daily Show. Enjoy! Comedy is a good way to get people talking about a serious issues. Good stuff.